The all-new Razer DeathAdder has been upgraded with the worlds first 6400dpi Optical Sensor. Achieve high levels of performance while retaining the feel of the optical sensor most DeathAdder users have come to love. 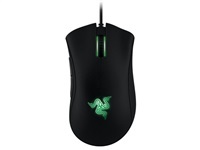 This mouses 4G sensor has also been optimized to work perfectly with all Razer mouse mats. Just choose from one of the preset Razer mouse mats in Synapse 2.0 to calibrate the sensor, or use the manual calibration mode if youre using a custom surface. Get 200ips and 50G acceleration even at the lowest dpi settings. So even though your mouse sensitivity is scaled down, it catches up to the physical movement of your hand across the surface for an almost 1-to-1 response between mouse and game. The all-new Razer DeathAdders mouse sensor has no drift control, ensuring that youll be able to make minor movements in game, especially vital for FPS gamers pulling off that perfect headshot. This is the pinnacle of gaming accuracy with an optical mouse sensor. Retaining the same right handed shape of its predecessor, this incarnation of the Razer DeathAdder improves upon the ergonomics by incorporating new rubber side grips. Your fingers stay firmly in control of the mouse no matter how aggressively you swipe. Razer Synapse 2.0 is cutting-edge intuitive proprietary software that functions as the Razer DeathAdders brain automatically syncing the gaming mouse to a cloud server to download driver and firmware updates, as well as save individual gamer settings without you needing to lift a finger. updates. After activation, full features are available in optional offline mode.